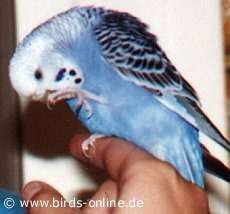 When I was nine years old, my very old and handsome budgie lady named Piep died after a sudden stroke. I missed her immediately and I was heartbroken about having lost my pet bird. After Piep's funeral in the garden of my grandparents, my parents promised me they would get me a new budgie as soon as possible. Shortly after they had given me that promise, Pünktchen came to our home. She had been born in September 1981 and it was exactly six weeks later when my parents bought her in a pet shop. Her name means "little spot" in English and I named her like that because her face was covered with lots of funny little throat spots. After a short while Pünktchen became very tame and she seemed to be addicted to me after initial shyness. My attempts to associate her with other budgies unfortunately failed. 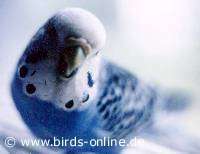 Concerning other birds, Pünktchen behaved very unfriendly and always became terribly angry and jealous if another budgie stayed in the same room as she did. At the age of scarcely ten years, Pünktchen got seriously ill. She had a tumor in her belly and had to be put to sleep on 05/27/92. My cute budgie lady was very curious concerning my camera. I tried to take a photo of her when she was sleeping, but she woke up (see photo below on the left). On the right you can see her examining the lens in detail and she came that close that I could not focus on her face anymore. Pünktchen did not carry an astronomical name since I was only nine years old when I got her and I wasn't infected with the "astrophysics fever" then.